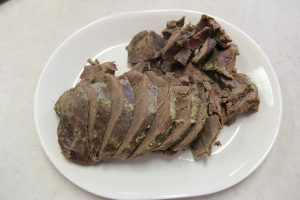 Delicious Venison Recipes Part 2 Here are two recipes–one for burger and one for roasts–that will have your mouth watering for more, and help you clear out the freezer for the next round of fine eating. Many people have venison in their freezers for long periods of time because they really do not know how to fix it properly. That doesn’t happen at our house because the venison goes fast. I have a handful of recipes that I use a lot. My family, and occasionally my friends rave over the venison. So if last year’s deer is languishing in your freezer, or your family isn’t that fond of venison, I would like to offer a couple more ways to fix it that will change the way you view venison. Last week we talked about great venison loin recipes. This week I would like to offer you my favorite way of fixing the rump roasts and burger. Because venison is so lean, it is very difficult to cook roasts without having it dry out. The best way that I have found to cook roasts is to cook it slowly in a crock pot with plenty of water. Cooking it in water assures that it doesn’t dry out too bad. Plus the juices make terrific gravy to pour over the roast and some mashed potatoes for a traditional hearty meal. Start by placing the roast in the slow cooker and covering it at least ¾ of the way with water. The roast will cook down and settle as it cooks so the water will cove r the entire roast. You will need to experiment with the brand and style of slow cooker you use. I have found that the taller crock pots work better for smaller roasts and the wider style work best for large roasts. I normally use a large roast for family meals, plus I love leftover cold venison roast sandwiches. I use bouillon to flavor the water which also flavors the roast while it simmers in the water. Use a beef bouillon cube for each cup and a half of water. Three cubes for 4-5 cups of water is what I normally use. Just drop them in alongside the roast. Dice up some garlic and onion and add to the mix, then cover the top of the roast with any other seasonings you may like. I have found that a generous sprinkling of Lawry’s Seasoned Salt creates a nice flavor. Experiment with other seasonings to suit your own personal taste. Cook the roast on low for about 6-8 hours. When it’s done it will fall apart when you remove it from the cooker. We often have this roast for Sunday dinner and I sometimes drop a frozen roast in the slow cooker the night before and put it on low. When I get up in the morning I switch it to the “warm” setting and it’s perfectly done when we get home from church. 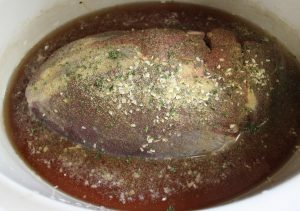 After removing the roast, use the juices left in the slow cooker to make gravy. Thicken with flour or corn starch for some of the most amazing gravy you have ever tasted. I can almost taste the roast and mashed potatoes slathered with venison gravy right now. Since venison is low in fat, the gravy is much better for you but it still tastes terrific. I was introduced to cowboy stew by a friend who I camped with a lot in high school. Martin Vaage was probably only 13 at the time when he showed up with all the ingredients at our campsite and we cooked cowboy stew over the campfire. It has become a favorite meal for many years. I use it a lot when camping and we eat it at home all the time. It’s remarkably simple and a perfect quick meal. Start by browning a pound of venison burger. A little salt water in the pan helps it brown without burning. The water will boil away. Drain if needed. 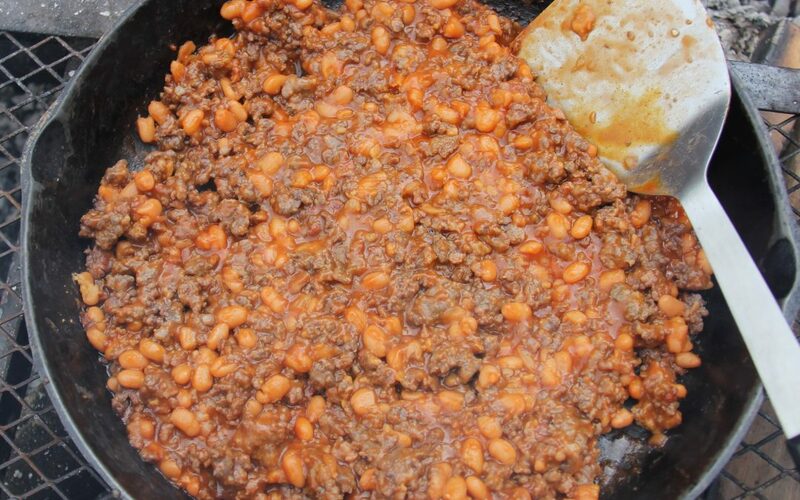 To the burger add one 15-ounce can of pork and beans, ¼ cup of ketchup and two tablespoons of Heinz 57 Steak Sauce. I like to add some onion to it also; usually a half a small onion diced. You can either sauté the onions in butter until they are limp in a separate pan, then add them to the stew, or just add some dried onion flakes (which is a lot easier if you make this dish while camping). Put the heat on low and simmer the whole mixture together for five minutes or so, stirring often. 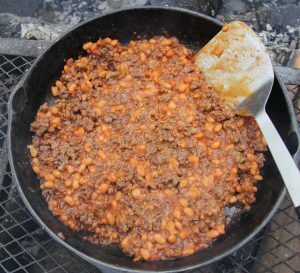 If you are making this dish on a campfire which I often do, move the pan off to the edge of the fire and keep stirring so it doesn’t burn to the bottom of the pan. Once the flavors are all blended together, spoon onto a plate or bowl and dig in. Everyone loves this dish and a couple pieces of toast to eat with it, especially campfire toast, complete a hearty meal that everyone will rave about! So go to your freezer and dig out that venison. With these ideas, you will enjoy some fine eating and your venison will not stay hidden in the corner of the freezer for months any more.